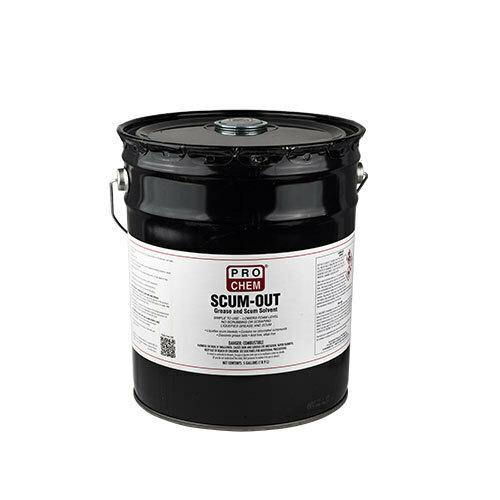 Scum-Out | Pro Chem, Inc. Utilization of SCUM-OUT eliminates the need for manual breakdown of grease balls, allowing the free flow of sewage. It also keeps tank walls clean of grease and scum by floating on the surface of the sewage. As the level of sewage in the tank is raised and lowered, SCUM-OUT coats the walls, keeping them grease free. It does not mix with the sewage and it inhibits foaming. It begins to work immediately on contact and can be used along with enzyme treatment. For Eliminating Scum Cake and Grease: Through any port or inspection hole, add 20-25 gallons of this product followed immediately by the addition of 500-2,000 gallons of water. Wet down top of grease cake with water daily. Daily addition of 1-2 gallons of this product in the sludge compartment allows effective and continuous treatment of both top and bottom of grease cake. Circulation should be continued as usual. For Pumping Station, Wet Wells and Sewer Lines: Add this product directly into force mains and sewer lines as needed to remove built-up grease. Allow this product to drip directly in wet wells and pumping stations.